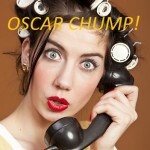 When Oscar Chump passed, news of his demise spread through the county like wildfire. By noon, twelve hours after Doc Neilson had reluctantly drawn the white sheet over Oscar’s slack face with a finality that sent Nurse Rodgers running from the room in tears, there wasn’t a soul alive within forty clicks who hadn’t heard about it. Later that same afternoon, over at the Wessex County Beauty Bar on Main Street, Adele Simpson was putting the finishing touches on Charlie Winship’s sister Louanne’s permanent when the telephone rang. Excusing herself, Adele went to answer the call. It was Muller’s Funeral Home. Anticipating that his next heart attack might well be his last, Oscar Chump had apparently left detailed instructions, Herb Muller informed her, including a request that she, Adele Simpson, the twenty-four-year-old raven-haired cosmetician and sole proprietor of the Wessex Beauty Bar, be the one to do his hair and makeup. “But Mr. Muller,” Adele protested, “I’ve never, that is to say, I’ve always worked on…” she was about to say “living,” but when she caught sight of Louanne Winship’s aged and hawk-like image staring at her from across the room, she changed her mind and let the sentence trail away unfinished. Dead or alive, Oscar Chump would always be the most famous, the most charismatic and the most charming client she would ever have. And while it is true to say that no one was shedding as many tears as Oscar might have hoped for, the whole town was caught up in the celebrity of his death. An event for which Oscar Chump was extremely well prepared. It was a pity he wasn’t alive to see it, thought Adele, suppressing a giggle as she hung up the phone. Now Adele Simpson might not have known Oscar Chump as long as Miss Winship had — Louanne had been at school with Oscar — but she had seen significantly more of him in recent years and thought she might know him just a tiny bit better than Miss Winship. Adele had driven by the Chump place almost every day when she was boarding with her aunt and uncle and attending the Wentworth Beauty Academy in nearby Colville. Oscar had become quite the gadabout by then, spending ten months out of every twelve on the road, playing honky-tonk piano and hawking records out of the trunk of his old Buick. When he was away, the old farmhouse stood empty, its white clapboard siding and green trim standing foursquare to the wind and looking sad. Occasionally, someone would hear Oscar’s name on the radio and talk would start up about asking him to play at the band shell in the park, but Oscar always said no. By the time he got home, he said, all he wanted to do was stay there and let the world come to his door. Which was exactly how Adele finally met him. It was a Saturday night. Adele had just finished giving her Aunt Ida a home permanent and was at the sink, feeling a little sorry for herself. The day had been a real scorcher and the windows in the house were all wide open. Honky-tonk filled the air, and gales of laughter drifted across the fields taunting her with their happy sounds. “That Oscar,” as everybody referred to him, was having a party. Adele wasn’t the only one who couldn’t sleep. Around midnight, her uncle had come stomping down the stairs in his bare feet, his dressing gown flapping behind him. He was hot, he was irritated, and he was threatening to call the police. Adele saw her chance and offered to go next door. If she asked nicely, she told her uncle, maybe they’d tone it down. Or even better, she said to herself, ask her in. But ten minutes later, when she hammered on the front door of the Chump house wearing a crisp white blouse and a fresh coat of buzz-buzz pink on her lips, whoever answered it took one look at her and slammed the door shut in her face. Not one to give up easily, Adele rapped even harder the second time.